Wicklow Swimming Club has been in continuous existence since 1941, though there are historical records showing a Swimming Club in existence in the town as far back as 1859. 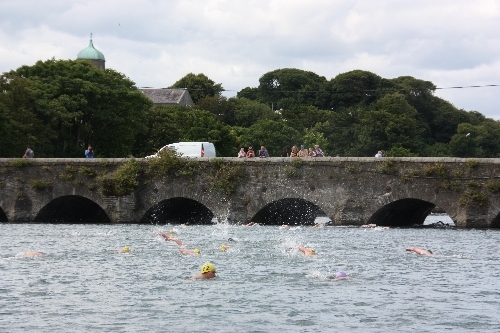 The Club is, traditionally, a Sea Swimming club with races taking place in Wicklow Harbour, the picturesque Wicklow Bay, and the Vartry river which enters the sea at Wicklow Harbour. The sea swimming season runs from the first Sunday in June to the end of August. In recent years the club has expanded hugely and has a very activepool section which caters for swimmers of all age groups, and abilities. WSC is currently one of the largest swimming clubs in Ireland. Each Sunday during the sea swimming season theClub holds sea sprint races for Under 6’s, Under 8’s, Under 10’s, and Under 12’s. This is then followed by the brilliant ‘Junior Challenge’ when all of the underage swimmers take part in a handicapped race which brings them into deeper water. Next up are the Intermediate swimmers who swim distances up to approximately 500 metres. Quickly following are the Youths section swimming distances up to 1.5KM. The main event then happens with in excess of 100 Senior swimmers entering the harbour to swim distances up to 2.1KM. WSC believes that it is unique in this level and type of sea swimming activity. WSC also hosts three Open Sea Swims during the summer months and these prove to be very popular with the swimming fraternity from the Leinster region, and beyond. 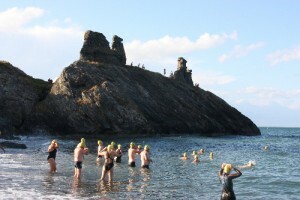 The open sea swims kick off in June with the Mid Summer Swim which brings swimmers along by the rugged and rocky , but beautiful, coast of Wicklow Town. The Club then hosts the Healy/O’Kane race which attracted huge numbers in 2014, including an Italian team. On the first Sunday in August the the WSC open takes place which sees swimmers starting halfway up Wicklow Bay and finishing at Wicklow beach, the traditional home of the club. The August Bank Holiday also sees the running of the Club’s ‘Masters Vartry’ . This takes place during a time when many emigrants return to the town, and is designed to re-ignite the flame of swimming within past members. This year witnessed the running of the 30th anniversary of this race, which had a huge participation, including 20 members of the tri-4-life group from Liverpool who really added to what was, already, a great occasion. The Pool section of WSC is ever expanding with numerous swimming Galas taking place. WSC fought long and hard to obtain a Swimming Pool for Wicklow Town and the club is, only now, reaping the rewards of its efforts. WSC is deeply committed to further expansion of its pool section. The strength of this great club has always been that it is a family club with fun, building relationships, and loyalty being of primary importance. WSC has members from most counties in Ireland, has members from England, Australia, Japan, China, Sweden, and many other countries all of whom live near to the beautiful town of Wicklow. WSC has produced many fine swimmers over the years, continues to grow from strength to strength, has strong safety and child protection measures in place, and, epitomises all that is best in the sport of swimming.